"Happy" is an uptempo soul and neo soul song on which Williams's falsetto voice has been compared to Curtis Mayfield by critics. The song has been highly successful, peaking at No. 1 in the United States, United Kingdom, Canada, Ireland, New Zealand, and 19 other countries. It was the best-selling song of 2014 in the United States with 6.45 million copies sold for the year, as well as in the United Kingdom with 1.5 million copies sold for the year. It reached No. 1 in the UK on a record-setting three separate occasions and became the most downloaded song of all time in the UK in September 2014; it is the eighth highest-selling single of all time in the country. It was nominated for an Academy Award for Best Original Song. A live rendition of the song won the Grammy Award for Best Pop Solo Performance at the 57th Annual Grammy Awards. The music video for "Happy" was nominated for Best Male Video and Video of the Year at the 2014 MTV Video Music Awards. It also won the Grammy Award for Best Music Video at the 57th Annual Grammy Awards. The song was Billboard's number-one single for 2014. "Happy" was the most successful song of 2014, with 13.9 million units (sales plus equivalent streams) worldwide. Williams provided vocals for French duo Daft Punk's 2013 album Random Access Memories, on the songs "Lose Yourself to Dance" and "Get Lucky". After returning from the recording sessions in Paris, he attended a meeting with record label managers who said that the results were "spectacular" and that "Get Lucky" would be Daft Punk's next single. They also made Williams an offer to record his own album, to which he agreed quickly, "overwhelmed that someone wanted to know what's in my heart." On December 17, 2013, it was announced that Williams had signed to Columbia Records and would release his second studio album in 2014. In a December 2013 press release, Rob Stringer, Chairman of Columbia Records, said "When we excitedly partnered with Pharrell in January of this year, we felt it was his time again. Since then, 'Blurred Lines' and 'Get Lucky' have defined pop music in 2013, and now we are preparing to launch Pharrell as a global solo superstar in 2014. 'Happy' is just the beginning." Williams originally wrote the song for CeeLo Green and felt Green's recording of the song was better, but Elektra Records, Green's record label, decided against it since he was on the verge of releasing his Christmas album, Cee Lo's Magic Moment. A 23-second sample of "Happy", a soul song. "Happy" was written and produced by Williams, with backing vocals by Rhea Dummett, Trevon Henderson, Ashley L. Lee, Shamika Hightower, Jasmine Murray and Terrence Rolle. The track was digitally edited and arranged by Andrew Coleman and Mike Larson, who also recorded it with assistance from Matthew Desrameaux at Circle House Studios in Miami, Florida. The song was later mixed by Leslie Brathwaite at Music Box Studios in Atlanta, Georgia. "Happy" plays for 3 minutes and 53 seconds in common time and at a tempo of 156 beats per minute. The song is written in the key of F minor. Williams sings the upper notes in falsetto; his vocal range spans from F4 to C6. His singing on the track has been compared to that of Curtis Mayfield. "Happy" is a mid-tempo soul and neo soul song. According to music journalist Paul Tingen, "Happy" is "a mid-tempo ... song in a faux-Motown style, with an arrangement that is, by modern standards, very sparse: programmed drums, one bass and one keyboard part, and handclaps both programmed and played, all topped off by Williams's lead vocals and a whole posse of backing vocals". Jody Rosen viewed the song as a "standout" with a "sprightly neosoul funk groove". Jody Rosen of Rolling Stone gave it 3.5 stars and deemed it "an instant contender for 2013's Song of the Summer". In a 4/5 review, Renowned for Sound's Huw Woodward said, "Happy is a rather… well… happy affair with a cheerful beat and exuberant vocal that would indicate that the former N.E.R.D singer is finding a lot of lighthearted fun to be had in both music and life. 'Because I'm happy, clap along if you feel like happiness is the truth' sings Williams as the jaunty rhythm gets your head nodding." Holly Williams of Contactmusic.com gave it four stars, praising it for being "unbelievably catchy" and "the kind of song that makes you want to dance and sing along". The song was nominated for Best Original Song at the 86th Academy Awards on March 2, 2014, but lost to "Let It Go" from Frozen. When GQ magazine asked Williams "how badly" he wanted the Oscar, he responded: "When they read the results, my face was...frozen. But then I thought about it, and I just decided just to... let it go." In January 2015, "Happy" was ranked at No. 13 on The Village Voice's annual year-end Pazz & Jop critics' poll. "I like that song 'Happy'…" remarked Phil Collins. "It's a great groove and he's a very smart guy." In October 2013, a month prior to its release, "Happy" catapulted to No. 1 on the Dutch Top 40 chart in the Netherlands, partially as a result of radio station 3FM airplay and subsequent online downloads, as well as featuring in a Transavia commercial. It was released worldwide on November 21, 2013. 2014, after 35 weeks in the charts and then still in the top 15, "Happy" became the most successful song in the Dutch Top 40 of all time. In the United Kingdom, "Happy" debuted at No. 71 on the UK Singles Chart on December 1, 2013. It then spent four weeks climbing before finally reaching No. 1 on December 29. It became Williams' third No. 1 song in Britain, counting "Get Lucky" and "Blurred Lines", where he appeared as a featured artist. It has since spent four non-consecutive weeks at No. 1, reaching the peak on three separate occasions. In doing so, Williams became only the third artist ever to achieve this, and the first since Guy Mitchell in 1957 with "Singing the Blues". Following the single's third week at No. 1, it spent five weeks in the top three before returning to the summit, boosted by his performance at the 2014 Brit Awards. In the same week that "Happy" returned to No. 1 for the third time, it sold its millionth copy in the UK, Williams' third in under a year, having previously done so with Daft Punk's "Get Lucky" in June 2013, and Thicke's "Blurred Lines" in July 2013. This made Williams only the second artist in UK chart history (the first being The Beatles) to have three singles sell 1 million copies in under a year, as well as only the third artist ever to have three million-sellers, along with The Beatles (who have six) and Rihanna (who has four). 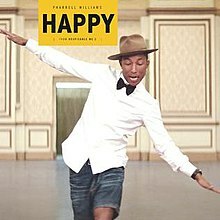 "Happy" was the best-selling single of UK in 2014 with 1.5 million copies sold for the year, and became the most downloaded song of all time in the UK by September 2014, with over 1.62 million sold. It had also been streamed over 25 million times and was the first song released in the 2010s to go 3× Platinum. With the inclusion of streaming, "Happy" has achieved combined sales of over 2 million. Additionally, "Happy" and Idina Menzel's "Let It Go" became the first singles ever to spend an entire calendar year on the official UK top 75 chart. On June 12, it was announced that "Happy" had overtaken "Evergreen" by Will Young as the UK's best-selling single of the 21st century with sales of 1.81 million. "Happy" spent 92 weeks in the UK top 100. On April 22, 2016, "Happy" went 4× Platinum. As of September 2017[update], the song has sold 1,922,000 copies, which gives a total of 2,630,000 combined units when 70 million streams are included. On the New Zealand Singles Chart, "Happy" debuted at No. 11 on December 23, 2013. The next week it moved to No. 2. Then on January 6, 2014, "Happy" began a 12-week consecutive reign in the No. 1 position, right up until March 24, 2014. It then dropped to No. 2 for one week, then spent a further three weeks at No. 1, bringing the total number of weeks at No. 1 to fifteen, breaking the 36-year-long record for most weeks spent at No. 1, previously held by Boney M.'s "Rivers of Babylon". As of February 22, 2015[update], "Happy" had spent 62 straight weeks in the New Zealand Top 40 since its debut, before finally dropping out of the chart the following week. The song has been certified 6× Platinum in New Zealand. "Happy" reached the top of the US Billboard Hot 100 for the week ending March 8, 2014, giving Williams his fourth No. 1 single on the chart, but his first as lead artist. It took twelve years and a week (as the issue date is March 8, 2014) to achieve his first Hot 100 No. 1 hit as a lead artist. The song remained at No. 1 the following week, and also topped the Hot 100 Airplay chart. The song also holds the record for the second-highest audience peak for a week on the Hot 100 Airplay, with 225.9 million impressions while Robin Thicke's "Blurred Lines", a song in which Pharrell was featured as well as produced and co-wrote, holds the all-time record. The song remained at the No. 1 position longer than any other song in the calendar year. The single passed its 4 million sales mark in April 2014, the first song of 2014 to do so. On the week of May 17, 2014, after spending ten weeks at the summit, "Happy" was finally knocked off of number one by John Legend's "All of Me" down to the No. 2 spot. "Happy" became the 28th song in the history of the chart to reach this milestone. It spent a total of 22 weeks in the top 10, entering on the week-ending February 15, 2014 and departing on July 19, 2014. The song sold 5,633,000 copies in the US in the first six months of 2014, the most ever of any song in the first six months of any calendar year. It was also the best-selling song of 2014 in the US with 6.45 million copies sold for the year, and has sold over 6.9 million total copies in the US as of April 2015[update]. The song also topped the charts of 22 other countries, including Australia, Austria, Canada, France, Germany, Ireland, Italy, Poland and Spain. It has spent twelve weeks (including seven consecutive) at No. 1 in Ireland, making it the third song in less than a year to spend more than seven weeks at No. 1, after Robin Thicke's "Blurred Lines" and Avicii's "Wake Me Up!". In France, "Happy" spent 22 weeks at No. 1, the longest reign at the top of the Syndicat National de l'Edition Phonographique, beating Lou Bega's "Mambo No. 5", which spent 20 weeks at No. 1 in 1999. To coincide with the single release, the website 24hoursofhappy.com was launched, featuring a visual presentation of "Happy", which was advertised as being "the world's first 24-hour music video." The video was shot by steadicam operator Jon Beattie, its creative director was Yoann Lemoine and its director the French directing team We Are from LA. It consists of the four-minute song repeated multiple times, with various people dancing around Los Angeles and miming along. The website allows users to navigate to various points in the 24-hour timeframe, including all 360 four-minute segments. Williams himself appears 24 times in the day-long video, once at the start of each hour. There are a number of celebrity cameos in the video, including Tyler, the Creator, Earl Sweatshirt, Whit Hertford, Kelly Osbourne, Rob Zabrecky, Magic Johnson, Urijah Faber, Sérgio Mendes, Jimmy Kimmel, Odd Future, Steve Carell (who plays Gru in Despicable Me 2), Jamie Foxx, Ana Ortiz, Miranda Cosgrove (who plays Margo in Despicable Me 2), Kazuchika Okada, Gavin DeGraw, and JoJo. The minions from Despicable Me 2 make several appearances throughout the film, including one scene at 3:00 am, in which Pharrell Williams and the minions dance in a movie theatre that is playing the scene from Despicable Me 2 in which "Happy" appears. A lone, one-eyed minion also appears dancing to song in its entirety at 4:40 pm. An official four-minute edit of the video was also released onto YouTube on November 21, 2013, and as of March 2018[update] has had over 1 billion views. It was nominated for Best Male Video and Video of the Year at the 2014 MTV Video Music Awards. The 24-hour music video for "Happy" was also projected at the Buenos Aires International Festival of Independent Cinema in April 2014. The original video spawned many cover videos on YouTube in which people from different cities throughout the world dance to the song. Those videos are usually called "Pharrell Williams – Happy – We Are from [name of the city]". As of May 2014[update], more than 1,500 videos have been created. Inspired by this global phenomenon, a French couple launched a website wearehappyfrom.com to showcase the remakes. In April 2014, the Embassy of the United States, Yerevan, Armenia released a video titled "Happy Yerevan", directed by Artyom Abovyan featuring US ambassador John A. Heffern and several Armenian celebrities, such as singers André, Emmy and Aram Mp3. The same month artsmedia Albania produced a music video for the track featuring inhabitants of Tirana. The video soon became viral in Albania and caused controversy over the usage of images of Albanian First Secretary Enver Hoxha. In May 2014, a group of Iranian fans who created a tribute to "Happy" were arrested. According to a police chief, the song represented vulgarity and also hurt public chastity. Williams responded to the arrest in a tweet stating "It's beyond sad these kids were arrested for trying to spread happiness." Soon after Iran's President Hassan Rouhani criticized the arrest when he tweeted "#Happiness is our people's right. We shouldn't be too hard on behaviours caused by joy." The dancers, along with the director, were later released. It was reported on September 19, 2014 that seven of the individuals in the Iranian video had been handed suspended punishments of 91 lashes each along with jail sentences by Iranian courts. The result of the suspended sentence is that if another crime is committed in the next three years, then the punishments will be carried out. ^ a b c d "Happy (From "Despicable Me 2") – Single by Pharrell Williams". iTunes US. Retrieved November 23, 2013. ^ a b c Despicable Me 2: Original Motion Picture Soundtrack (Media notes). Back Lot Music, Columbia Records. 2013. ^ a b Grein, Paul (December 31, 2014). "It's Official: Pharrell Has 2014's Best-Selling Song". Yahoo! Music. Retrieved April 22, 2015. ^ a b Copsey, Rob (January 1, 2015). "The Official Top 40 Biggest Selling Singles of 2014". Official Charts Company. Retrieved January 1, 2015. ^ Copsey, Rob (September 9, 2014). "Pharrell's Happy now the UK's most downloaded track of all time". Official Charts Company. Retrieved April 22, 2015. ^ a b c Copsey, Rob (September 19, 2017). "The UK's Official Chart 'millionaires' revealed". Official Charts Company. Retrieved September 27, 2017. ^ a b "Best Male Video 2014 MTV Video Awards". MTV. Viacom. August 24, 2014. Retrieved August 24, 2014. ^ a b "Video Of The Year 2014 MTV Video Music Awards". MTV. Viacom. August 24, 2014. Retrieved August 24, 2014. ^ "IFPI publishes Digital Music Report 2015". International Federation of the Phonographic Industry. 14 April 2015. p. 12. Retrieved 15 April 2015. ^ Batey, Angus (February 21, 2014). "We Heard Pharrell's New Album & This Is What It Sounds Like". NME. Retrieved March 20, 2014. ^ a b "Pharrell Williams Signs To Columbia Records". Vibe. December 17, 2013. Retrieved March 20, 2014. ^ Showbiz, Bang (May 1, 2014). "Pharrell Williams – Pharrell Williams: Happy was for Cee Lo Green". Contactmusic.com. Retrieved May 1, 2014. ^ Reed, Ryan (April 30, 2014). "Pharrell Says 'Happy' Originally Recorded by Cee Lo Green". Rolling Stone. Retrieved March 23, 2019. ^ Michaels, Sean (April 30, 2014). "Pharrell Williams' Happy was originally recorded by Cee Lo Green". The Guardian. Retrieved March 23, 2019. ^ Blake, Jimmy (May 1, 2014). "Pharrell's Happy originally recorded by Cee Lo Green". Newsbeat. Retrieved March 23, 2019. ^ a b "Pharrell Williams – Happy – The World's First 24 Hour Music Video". Retrieved March 20, 2014. ^ a b ""Happy" By Pharrell Williams – Digital Sheet Music". Musicnotes.com. EMI Music Publishing. Retrieved January 26, 2013. ^ a b c d Rosen, Jody (June 7, 2013). "Pharrell – Happy". Rolling Stone. Retrieved November 23, 2013. ^ Wood, Mikael (February 20, 2014). "Pharrell Williams, a 'Happy' and busy guy". Los Angeles Times. Retrieved March 3, 2013. ^ a b Tingen, Paul (May 2014). "Inside Track: Happy". Sound on Sound. Cambridge. Retrieved October 23, 2014. ^ Ryland, Ali (July 1, 2014). "Wireless Festival 2014: From OutKast to Pharrell, the top ten acts to watch". Metro. Retrieved May 25, 2015. ^ a b Williams, Holly. "Pharrell Williams – Happy Single Review". Contactmusic.com. Retrieved March 3, 2014. ^ a b Woodward, Huw (January 16, 2014). "Single review: Pharrell Williams – 'Happy'". Renowned for Sound. Retrieved February 16, 2014. ^ "2013 Nominations". Archived from the original on April 19, 2014. Retrieved 2015-08-19. . International Press Academy. ^ "Singles: All Votes". The Village Voice. January 2014. Archived from the original on 20 January 2015. Retrieved 31 October 2018. ^ White, Terri (December 2014). "Cash for questions". Q. p. 32. ^ Oitmann, Pierre (October 11, 2013). "Pharrell Williams scoort eerste solo-nummer 1-hit". NU.nl (in Dutch). Sanoma. Retrieved November 24, 2013. ^ (in Dutch) "Happy van Pharrell Williams grootste Top 40-hit ooit". Archived from the original on April 12, 2014. . Dutch Top 40. ^ a b "Top 2500" (in Dutch). Dutch Top 40. Retrieved April 15, 2014. ^ "Official Singles Chart Top 100: 01 December 2013 – 07 December 2013". Official Charts Company. December 7, 2013. Retrieved April 10, 2015. ^ a b "Official Singles Chart Top 100". Official Charts Company. Retrieved January 26, 2014. ^ Duncan, Amy (December 29, 2013). "X Factor winner Sam Bailey's reign lasts just one week as she is knocked off No.1 spot by Pharrell". Metro. Retrieved March 3, 2014. ^ a b c d Myers, Justin (March 2, 2014). "Unstoppable Pharrell scores chart record hat-trick as Happy smashes a million". Official Charts Company. Retrieved March 3, 2014. ^ a b Copsey, Rob (June 11, 2015). "The Official Top 40 Biggest Selling Singles of the Millennium so far revealed". Official Charts Company. Retrieved June 12, 2015. ^ "Pharrell's Happy achieves rare triple platinum sales". Newsbeat. BBC Online. July 24, 2014. Retrieved April 22, 2015. ^ Jones, Alan (November 3, 2014). "Official Charts Analysis: Taylor Swift tops albums with 90,336 sales of 1989". Music Week. Mediaor.com. Retrieved May 25, 2015. ^ "Pharrell Williams". Official Charts Company. ^ "Chart News". April 22, 2016. Retrieved May 29, 2016. ^ a b c "Charts.nz – Pharrell Williams – Happy". Top 40 Singles. Retrieved December 23, 2013. ^ Manning, Brendan (April 28, 2014). "Pharrell's happy chart-buster". The New Zealand Herald. Retrieved April 28, 2014. ^ a b "New Zealand single certifications – Pharrell Williams – Happy". Recorded Music NZ. Retrieved January 30, 2015. ^ Trust, Gary (February 26, 2014). "Pharrell Williams' 'Happy' Hits No. 1 On Hot 100". Billboard. Retrieved February 26, 2014. ^ Trust, Gary (March 5, 2014). "Pharrell's 'Happy' Holds at No. 1 On Hot 100". Billboard. Retrieved March 6, 2014. ^ Trust, Gary (April 2, 2014). "Pharrell Williams' 'Happy' Holds Atop Hot 100; DJ Snake & Lil Jon Hit Top 10". Billboard. Retrieved April 3, 2014. ^ Grein, Paul (March 26, 2014). "Chart Watch: "Happy" tops 4M". Chart Watch. Yahoo! Music. Retrieved March 30, 2014. ^ Trust, Gary (May 7, 2014). "John Legend's 'All Of Me' Tops Hot 100, Ariana Grande Debuts At No. 3". Billboard. Retrieved May 10, 2014. ^ Trust, Gary (April 30, 2014). "Pharrell Williams Tops Hot 100 For 10th Week, Iggy Azalea Vaults Into Top 10". Billboard. Retrieved April 30, 2014. ^ Grein, Paul (July 3, 2014). "Chart Watch Extra: 12 Facts About 2014's First Six Months in Music". Archived from the original on July 14, 2014. . Chart Watch. Yahoo! Music. ^ a b "The Rise of Uptown Funk: Could It Become the All-Time #1 Seller?". Hits. April 9, 2015. Retrieved April 9, 2015. ^ Corner, Lewis (February 14, 2014). "Pharrell Williams holds on to Irish No.1 with 'Happy'". Digital Spy. Retrieved February 15, 2014. ^ Wöber, Sebastian (November 28, 2013). "How did Jon Beattie shoot Pharrell's "24 Hours of Happy"?". cinema5D. Retrieved May 17, 2014. ^ Tierney, Luke (November 27, 2013). "Pharrell Williams 'Happy' by We Are From LA". Promonews.tv. Retrieved March 8, 2014. ^ "57th Annual GRAMMY Awards Winners & Nominees". Archived from the original on February 10, 2015. . Grammy.com. The Recording Academy. ^ Awazie, Ikechi (February 27, 2014). "Be An Inspiration: 24 Hours Of Happy Music". Be A Light To The World. Retrieved May 13, 2014. ^ Nagle, Robert (March 2, 2014). "Robert's Ultimate Guide to all 24 hours of Pharrell Williams' Happy Video". Imaginary Planet. Retrieved October 8, 2014. ^ "Pharrell Williams – Happy (Official Music Video)". i Am Other. YouTube. November 21, 2013. Retrieved March 4, 2018. ^ "BAFICI" (PDF) (in Spanish). Government of Buenos Aires. Retrieved May 18, 2016. ^ "Search for happy pharrell williams we are from – Overview". YouTube. Retrieved February 18, 2014. ^ "#BBCtrending: Pharrell's hit video inspires 1,000 re-makes". BBC News Online. April 4, 2014. Retrieved April 6, 2014. ^ "Happy Yerevan". U.S. Embassy in Armenia. April 8, 2014. Retrieved April 9, 2014. ^ "Happy Yerevan (Aram MP 3, US Ambassador, Andre & Others)". Tert.am. April 9, 2014. Retrieved April 9, 2014. ^ "We Are Happy From Tirana – Pharrell Williams #HAPPYFROMTIRANA". artsmedia Albania. April 18, 2014. Retrieved April 26, 2014. ^ Cooper, Hayden (May 21, 2014). "Iranians arrested after posting their own video of Pharrell Williams's song Happy on YouTube". ABC Online. Retrieved May 21, 2014. ^ Ensor, Josie; Vahdat, Ahmad (May 21, 2014). "Young Iranians arrested for 'vulgar' Pharrell Williams' Happy dance". The Daily Telegraph. Retrieved May 21, 2014. ^ Hafiz, Yasmine (May 20, 2014). "Young Iranians arrested for 'vulgar' Pharrell Williams' Happy dance". The Huffington Post. Retrieved May 21, 2014. ^ "Iranian Pharrell fans arrested for Happy tribute video". BBC News Online. May 21, 2014. Retrieved May 21, 2014. ^ "Pharrell Williams". Twitter. May 20, 2014. Retrieved June 10, 2015. ^ "Hassan Rouhani". Twitter. May 21, 2014. Retrieved Feb 16, 2017. ^ Mackey, Robert (May 29, 2014). "Director of 'Happy in Tehran' Video Is Reportedly Freed". The New York Times. Retrieved June 4, 2014. ^ Dehghan, Saeed Kamil (September 19, 2014). "Iranian Pharrell Williams fans behind Happy video sentenced". The Guardian. Retrieved September 19, 2014. ^ "Australian-charts.com – Pharrell Williams – Happy". ARIA Top 50 Singles. Retrieved January 4, 2014. ^ "Austriancharts.at – Pharrell Williams – Happy" (in German). Ö3 Austria Top 40. Retrieved November 23, 2013. ^ a b "Ultratop.be – Pharrell Williams – Happy" (in Dutch). Ultratop 50. Retrieved November 23, 2013. ^ "Ultratop.be – Pharrell Williams – Happy" (in French). Ultratop 50. Retrieved November 29, 2013. ^ "Top 100 – 3 de junho de 2014". Billboard Brasil (in Portuguese). June 3, 2014. Archived from the original on June 7, 2014. Retrieved June 5, 2014. ^ "10.03.14 – 16.03.14" Airplay Top 5. Bulgarian Association of Music Producers. Retrieved April 7, 2014. ^ "Pharrell Williams Chart History (Canadian Hot 100)". Billboard. Retrieved January 26, 2014. ^ Pharrell Williams — Happy. Tophit. Retrieved December 20, 2018. ^ "ČNS IFPI" (in Czech). Hitparáda – Radio Top 100 Oficiální. IFPI Czech Republic. Note: Change the chart to CZ – RADIO – TOP 100 and insert 201409 into search. Retrieved March 16, 2014. ^ "ČNS IFPI" (in Czech). Hitparáda – Digital Top 100 Oficiální. IFPI Czech Republic. Note: Change the chart to CZ – SINGLES DIGITAL – TOP 100 and insert 201418 into search. Retrieved July 15, 2014. ^ "Danishcharts.com – Pharrell Williams – Happy". Tracklisten. Retrieved November 29, 2013. ^ (in Spanish) "Top 20 General". Archived from the original on April 6, 2014. . Monitor Latino. RadioNotas. ^ "January 11, 2014 – Euro Digital Songs". Billboard. Retrieved January 31, 2014. ^ "Pharrell Williams: Happy (From Despicable Me 2)" (in Finnish). Musiikkituottajat – IFPI Finland. Retrieved February 8, 2014. ^ "Lescharts.com – Pharrell Williams – Happy" (in French). Les classement single. Retrieved November 29, 2013. ^ "Offiziellecharts.de – Pharrell Williams – Happy". GfK Entertainment Charts. Retrieved December 23, 2013. ^ "Airplay Charts Deutschland – Woche 03/2014" (in German). German Charts. Retrieved January 30, 2017. ^ "April 19, 2014 – Greece Digital Songs". Billboard. Retrieved April 17, 2014. ^ "Archívum – Slágerlisták – MAHASZ" (in Hungarian). Dance Top 40 lista. Magyar Hanglemezkiadók Szövetsége. Retrieved May 15, 2014. ^ "Archívum – Slágerlisták – MAHASZ" (in Hungarian). Rádiós Top 40 játszási lista. Magyar Hanglemezkiadók Szövetsége. Retrieved January 23, 2014. ^ "Archívum – Slágerlisták – MAHASZ" (in Hungarian). Single (track) Top 40 lista. Magyar Hanglemezkiadók Szövetsége. Retrieved January 16, 2014. ^ "Chart Track: Week 1, 2014". Irish Singles Chart. Retrieved January 26, 2014. ^ "Pharrell Williams – Happy Media Forest". Israeli Airplay Chart. Media Forest. Retrieved June 22, 2014. ^ "Italiancharts.com – Pharrell Williams – Happy". Top Digital Download. Retrieved January 26, 2014. ^ "Pharrell Williams Chart History (Japan Hot 100)". Billboard. Retrieved April 17, 2014. ^ "Pharrell Williams". The Official Lebanese Top 20. Retrieved March 2, 2014. ^ "January 18, 2014 – Luxembourg Digital Songs". Billboard. Retrieved January 17, 2014. ^ "March 29, 2014 – Mexico Ingles Airplay". Billboard. Retrieved March 28, 2014. ^ "Nederlandse Top 40 – Pharrell Williams – Happy" (in Dutch). Dutch Top 40. Retrieved November 23, 2013. ^ "Dutchcharts.nl – Pharrell Williams – Happy" (in Dutch). Single Top 100. Retrieved November 23, 2013. ^ "Norwegiancharts.com – Pharrell Williams – Happy". VG-lista. Retrieved February 8, 2014. ^ "Listy bestsellerów, wyróżnienia :: Związek Producentów Audio-Video". Polish Airplay Top 100. Retrieved February 17, 2014. ^ "November 30, 2013 – Portugal Digital Songs". Billboard. Retrieved November 29, 2013. ^ "Airplay 100 – Cristi Nitzu". Kiss FM. Note: User may scroll down the 'Podcasturi' menu to play or download the respective podcast. Retrieved 27 January 2018. ^ "Media Forest – Weekly Charts. Media Forest. 17 March 2014. Retrieved 2 July 2018. Note: Romanian and international positions are rendered together by the number of plays before resulting an overall chart. ^ "Media Forest – Weekly Charts. Media Forest. 17 March 2014. Retrieved 3 July 2018. Note: Select 'Songs – TV'. Romanian and international positions are rendered together by the number of plays before resulting an overall chart. ^ "Russia Airplay Chart for 2014-05-26." Tophit. Retrieved December 20, 2018. ^ "Official Scottish Singles Sales Chart Top 100". Official Charts Company. Retrieved January 26, 2014. ^ "EMA Top 10 Airplay: Week Ending 2014-01-28". Entertainment Monitoring Africa. Retrieved April 26, 2014. ^ "2014년 02주차 Download Chart" (in Korean). Gaon Download Chart. Retrieved January 3, 2014. ^ "ČNS IFPI" (in Slovak). Hitparáda – Radio Top 100 Oficiálna. IFPI Czech Republic. Note: insert 201411 into search. Retrieved March 17, 2014. ^ "ČNS IFPI" (in Slovak). Hitparáda – Singles Digital Top 100 Oficiálna. IFPI Czech Republic. Note: Select SINGLES DIGITAL - TOP 100 and insert 201428 into search. Retrieved July 15, 2014. ^ "Tedenska lestvica: 14 Teden 31.03.2014 – 06.04.2014". SloTop50. Retrieved December 24, 2016. ^ "Spanishcharts.com – Pharrell Williams – Happy" Canciones Top 50. Retrieved March 28, 2014. ^ "Swedishcharts.com – Pharrell Williams – Happy". Singles Top 100. Retrieved January 10, 2014. ^ "Swisscharts.com – Pharrell Williams – Happy". Swiss Singles Chart. Retrieved December 3, 2013. ^ "Pharrell Williams Chart History (Hot 100)". Billboard. Retrieved February 26, 2014. ^ "Pharrell Williams Chart History (Adult Contemporary)". Billboard. Retrieved April 17, 2014. ^ "Pharrell Williams Chart History (Adult Pop Songs)". Billboard. Retrieved March 27, 2014. ^ "Pharrell Williams Chart History (Dance Mix/Show Airplay)". Billboard. Retrieved July 27, 2014. ^ "Pharrell Williams Chart History (Dance Club Songs)". Billboard. Retrieved April 10, 2014. ^ "Pharrell Williams Chart History (Hot R&B/Hip-Hop Songs)". Billboard. Retrieved January 9, 2014. ^ "Pharrell Williams Chart History (Pop Songs)". Billboard. Retrieved March 20, 2014. ^ "Pharrell Williams Chart History (Rhythmic)". Billboard. Retrieved March 4, 2014. ^ "Pharrell Williams Chart History (Rock Airplay)". Billboard. Retrieved March 4, 2014. ^ (in Spanish) "Record Report – Pop Rock General". Archived from the original on March 13, 2014. . Record Report. R.R. Digital C.A. ^ "ARIA Charts – End Of Year Charts – Top 100 Singles 2013". ARIA Charts. Retrieved January 26, 2014. ^ "Top 100 –Jaaroverzicht van 2013" (in Dutch). Dutch Top 40. Retrieved January 26, 2014. ^ "Jaaroverzichten – Single 2013" (in Dutch). Single Top 100. Hung Medien. Retrieved December 25, 2013. ^ "End of Year 2013" (PDF). UKChartsPlus. Retrieved June 7, 2014. ^ "ARIA Charts – End Of Year Charts – Top 100 Singles 2014". ARIA Charts. Australian Recording Industry Association. Retrieved January 3, 2014. ^ "Jahreshitparade Singles 2014" (in German). Austriancharts.at. Hung Medien. Retrieved April 22, 2015. ^ "Jaaroverzichten 2014" (in Dutch). Ultratop. Hung Medien. Retrieved April 22, 2015. ^ "Rapports annuels 2014" (in French). Ultratop. Hung Medien. Retrieved April 22, 2015. ^ "Brasil Hot Pop". Billboard Brasil. Vol. 2. December 2014. p. 97. ^ "Track Top-50 2014". Hitlisten.NU. Archived from the original on January 8, 2015. Retrieved April 22, 2015. ^ (in German) "Jahrescharts – 2014". Archived from the original on May 9, 2015. . Offiziellecharts.de. GfK Entertainment Charts. ^ "Best of 2014". Irish Recorded Music Association. Retrieved May 28, 2015. ^ ""מסתובב" הוא השיר הכי מושמע בישראל ב-2014". Mako.co.il. January 1, 2015. Retrieved April 22, 2015. ^ "FIMI – Classifiche Annuali 2014 "TOP OF THE MUSIC" FIMI-GfK: un anno di musica italiana" (in Italian). Federazione Industria Musicale Italiana. Retrieved January 19, 2015. ^ "Top 100-Jaaroverzicht van 2014" (in Dutch). Dutch Top 40. Retrieved April 25, 2015. ^ "Jaaroverzichten – Single 2014" (in Dutch). Single Top 100. Hung Medien. Retrieved January 4, 2015. ^ "End Of Year Charts 2014". Archived from the original on December 20, 2014. . Recorded Music NZ. ^ "Airplay 100 – Cristi Nitzu" (in Romanian). Kiss FM. Retrieved 3 July 2018. ^ "Tedenska lestvica: 2014 Leto". SloTop50. Retrieved December 24, 2016. ^ "Schweizer Jahreshitparade 2014" (in German). Hitparade.ch. Hung Medien. Retrieved April 22, 2015. ^ Copsey, Rob (December 31, 2014). "The Official Top 100 Biggest Songs of 2014 revealed". Official Charts Company. Retrieved April 22, 2015. ^ "Adult Contemporary Songs – Year End 2014". Billboard. Retrieved December 9, 2014. ^ "Adult Pop Songs – Year End 2014". Billboard. Retrieved December 9, 2014. ^ "Charts – Year End 2014". Billboard. Retrieved December 9, 2014. ^ "Pop Songs – Year End 2014". Billboard. Retrieved December 9, 2014. ^ "Rhythmic Songs – Year End 2014". Billboard. Retrieved December 9, 2014. ^ (in Spanish) "Resumen Anual 2014". Archived from the original on December 19, 2014. . Record Report. R.R. Digital C.A. ^ "Japan Hot 100 – Year End 2015". Billboard. Retrieved December 9, 2015. ^ "Top Aller Tijden – Singles" (in Dutch). Ultratop. Hung Medien. Retrieved May 23, 2014. ^ "Top de Tous les Temps – Singles" (in French). Ultratop. Hung Medien. Retrieved June 24, 2017. ^ Myers, Justin (June 14, 2018). "The UK's biggest selling singles of all time". Official Charts Company. Retrieved July 5, 2018. ^ "Greatest of All Time – Hot 100 Songs". Billboard. Retrieved August 1, 2018. ^ "Austrian single certifications – Pharrell Williams – Happy" (in German). IFPI Austria. Enter Pharrell Williams in the field Interpret. Enter Happy in the field Titel. Select single in the field Format. Click Suchen. ^ "Ultratop − Goud en Platina – singles 2016". Ultratop. Hung Medien. ^ "Canadian single certifications – Pharrell Williams – Happy". Music Canada. ^ "Certificeringer". IFPI Denmark. Retrieved June 6, 2014. ^ "Top 100 des singles les plus vendus en France du millénaire, épisode 2 (90-81)" (in French). Charts in France. Pure Charts. July 19, 2014. Retrieved October 11, 2014. ^ "French single certifications – Pharrell Williams – Happy" (in French). Syndicat National de l'Édition Phonographique. ^ "Gold-/Platin-Datenbank (Pharrell Williams; 'Happy')" (in German). Bundesverband Musikindustrie. ^ "Italian single certifications – Pharrell Williams – Happy" (in Italian). Federazione Industria Musicale Italiana. Select "2014" in the "Anno" drop-down menu. Select "Happy" in the "Filtra" field. Select "Singoli online" under "Sezione". ^ "Single Certification List – July 2014" (in Japanese). Recording Industry Association of Japan. Retrieved September 7, 2014. ^ "Pharrell Williams – Happy" (in Swedish). Grammofon Leverantörernas Förening. Retrieved September 7, 2014. ^ "The Official Swiss Charts and Music Community: Awards (Pharrell Williams; 'Happy')". IFPI Switzerland. Hung Medien. Retrieved September 7, 2014. ^ "British single certifications – Pharrell Williams – Happy". British Phonographic Industry. Select singles in the Format field. Select Platinum in the Certification field. Type Happy in the "Search BPI Awards" field and then press Enter. ^ "American single certifications – Pharrell Williams – Happy". Recording Industry Association of America. If necessary, click Advanced, then click Format, then select Single, then click SEARCH. ^ "Certificeringer – Pharrell Williams – Happy". IFPI Denmark. Retrieved September 7, 2014. ^ "Top 100 Streaming – Semana 30: Del 21.07.2014 Al 27.07.2014" (in Spanish). PROMUSICAE. Retrieved July 31, 2014. ^ Bella, Sarah (May 22, 2013). "Pharrell Williams Streams 'Happy' From 'Despicable Me 2'". Music Feeds. Retrieved November 24, 2013. ^ "Happy (From "Despicable Me 2") – Single by Pharrell Williams". iTunes Australia. Retrieved November 24, 2013. ^ "Happy (From "Despicable Me 2") – Single von Pharrell Williams" (in German). iTunes Austria. Retrieved November 24, 2013. ^ "Single by Pharrell Williams". iTunes Belgium. Retrieved November 24, 2013. ^ "Single by Pharrell Williams". iTunes Canada. Retrieved November 24, 2013. ^ "Happy (From "Despicable Me 2") – Single by Pharrell Williams". iTunes Denmark. Retrieved November 24, 2013. ^ "Happy (From "Despicable Me 2") – Single by Pharrell Williams". iTunes Finland. Retrieved November 24, 2013. 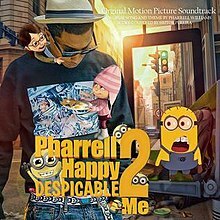 ^ "Happy (From "Despicable Me 2") – Single par Pharrell Williams" (in French). iTunes France. Retrieved November 24, 2013. ^ "Happy (From "Despicable Me 2") – Single von Pharrell Williams" (in German). iTunes Germany. Retrieved November 24, 2013. ^ "Happy (From "Despicable Me 2") – Single by Pharrell Williams". iTunes Greece. Retrieved November 24, 2013. ^ "Happy (From "Despicable Me 2") – Single di Pharrell Williams" (in Italian). iTunes Italy. Retrieved November 24, 2013. ^ ファレル・ウィリアムス Happy (From "Despicable Me 2") – Single by Pharrell Williams (in Japanese). iTunes Japan. Retrieved November 24, 2013. ^ "Happy (From "Despicable Me 2") – Single by Pharrell Williams". iTunes Latin America. Retrieved November 24, 2013. ^ "Happy (From "Despicable Me 2") – Single' van Pharrell Williams" (in Dutch). iTunes Netherlands. Retrieved November 24, 2013. ^ "Happy (From "Despicable Me 2") – Single by Pharrell Williams". iTunes New Zealand. Retrieved November 24, 2013. ^ "Happy (From "Despicable Me 2") – Single by Pharrell Williams". iTunes Norway. Retrieved November 24, 2013. ^ "Happy (From "Despicable Me 2") – Single de Pharrell Williams" (in Spanish). iTunes Spain. Retrieved November 24, 2013. ^ "Happy (From "Despicable Me 2") – Single av Pharrell Williams" (in Swedish). iTunes Sweden. Retrieved November 24, 2013. ^ "Happy (From "Despicable Me 2") – Single by Pharrell Williams". iTunes United Kingdom. Retrieved November 24, 2013. ^ "Hot/Mod/AC Future Releases". All Access Media Group. Archived from the original on January 13, 2014. Retrieved January 26, 2014. ^ "Top 40/Mainstream Future Releases". All Access Media Group. Archived from the original on January 13, 2014. Retrieved January 26, 2014.